Funding for “maternity leave,” plus a child-care tax credit that favors the rich, are programs targeted at the well-off white women who are abandoning the GOP. Ivanka Trump just reprised the role she played at the Republican convention, depicting her father as the friend of working women, a president who would advance progressive policies on child care and family leave. After her widely praised convention speech, though, it came out that the Trump organization provides neither to its employees—Trump claimed he provided child care, but it turned out he was confused about a program for the kids of wealthy Trump hotel guests, the Trumpeteers. On Tuesday, Trump’s oldest daughter helped her father introduce his outreach program to women voters on family issues at a suburban Philadelphia speech. 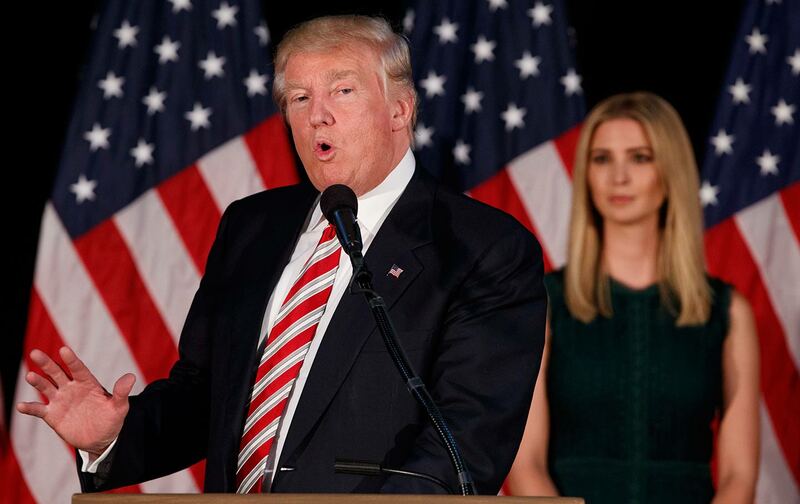 The GOP nominee gave Ivanka all the credit earlier in the day: “She’s the one who’s been pushing for this. ‘Daddy, Daddy, we have to do this.’ And she’s right.” He made his accomplished daughter sound like a toddler whining to get a “Pretty Pretty Princess” game for Christmas. So empowering. So what’s Trump’s plan? It’s just as regressive as you would expect. He proposes to provide six weeks of paid “maternity leave”—that’s right, dads aren’t eligible—by cutting into unemployment insurance, supposedly eliminating “fraud.” But it would only help those whose state legislatures opt in, and it would provide much less than most women’s existing salaries. Trump would also provide a child-care tax credit—but it would benefit the wealthy way more than middle-class families, and provide almost nothing for the working poor, whose salaries are below the level at which they pay federal taxes. Families with stay-at-home mothers would also be eligible for some form of the credit, a sop to the conservative right. Clinton would provide a paid 12-week “family leave,” available to fathers as well as family members caring for a sick relative, paid via higher taxes on the wealthy. She also proposes a wide range of child-care and preschool programs, subsidized at various levels, with costs capped for middle-class families at 10 percent of their salaries. Both plans would require Congressional approval; Clinton’s loftier ambitions reflect her higher goals for family security and women’s equality. But Trump’s point isn’t to help middle-class and working-poor families, or red states. Trump is aiming at his biggest political vulnerability: the high percentage of white college-educated women who normally vote Republican but won’t support him. Mitt Romney won this group narrowly in 2012; Trump is losing by 23 points in the last national Washington Post/ABC poll. The GOP nominee’s slapdash proposal isn’t intended to solve social and economic problems but political ones. One step forward for women on the Trump trail, two steps back. Of course, even a slapdash effort is somewhat surprising, coming from Trump, who has expressed consistently negative opinions about working women over the years. He’s called a worker’s pregnancy “an inconvenience for the business” and once humiliated an attorney who needed a break from a deposition to pump breast milk by calling her “disgusting” and walking out. He’s shared his own extensive marital experience—he’s on wife No. 3—and explained why working women are bad for marital happiness. “Putting a wife to work is a dangerous thing,” he said after his first marriage failed. The same day Trump and Ivanka stepped up outreach to women, Operation Rescue president Troy Newman endorsed the GOP nominee. Newman, who is also on the board of the Planned Parenthood video-hoax perpetrators, the Center for Medical Progress, may be best known for advocating the execution of “abortionists.” That’s the 2016 presidential race in a nutshell. One step forward for women on the Trump trail, two steps back.